Maharashtra, the third largest state of India, is famous for a number of things. One, it is serious about Bollywood. The capital city of Mumbai is a city that never sleeps, and the city of dreams for all those who wish to have a career in Bollywood. Two, Maharashtra knows how to celebrate festivals with absolute grandeur, especially the festival of Ganesh Chaturthi. Three, the street food of this state is to die for! One simply does not leave the state without having their lip-smacking vada pav and pani puri! And finally, the Konkan coast which is lined up with plenty of amazing laid-back beaches. Sindhudurg district in the Konkan coast, derived its name because of the famous fort that is found here. In fact, Sindhudurg literally translates to "fort in the sea". The fort is in the Malvan village and is said to be built by King Shivaji. By Air: The closest airport to Sindhudurg is the Goa International Airport at Dabolim, which has connectivity to all the major cities of India like Kolkata, Delhi etc. It is located 155 km from Sindhudurg and 90 km from Sawantavadi city. Another option is the Kolhapur Airport, located at a distance of 134 km, which is well-connected with cities of Maharashtra like Pune, Mumbai, etc. By Train: Kankvalli, Sawantwadi and Kudal Railway Stations are the closest stations that connect to all major cities of India. They are all at a distance 20-40 km from Sindhudurg. The Sindhudurg Railway Station connects to some major cities like Goa, Pune, Bangalore, etc. By Road: Sindhudurg has the Maharashtra State Government (MSRTC) buses operating from all over Mumbai and other nearby cities. Apart from this, taxis are available in abundance to reach Sindhudurg. A number of National Highways run through Maharashtra making it very easy to travel from any part of India. September to April are the best months to visit the beaches near Sindhudurg. Try avoiding the monsoon months of June to September since the rains are irregular and heavy. Read further to discover some of the best beaches around Sindhudurg. Tucked away in solitude, Mochemad Beach is located 86 km from the town of Sindhudurg. This picturesque beach harbours clean golden sand and water of Arabian Sea. Since Mochemad is still an upcoming beach, it is a haven for someone looking to beat the city blues for a weekend. Green hills and coconut trees that surround the beach makes it all the more beautiful. Water sports such as snorkelling, parasailing, surfing and diving are available at this beach. Tarkarli is a quaint village that is an upcoming tourist hub, located 64 km from Sidhudurg town. It is home to the serene Tarkarli Beach which has clean white sand. Just lay back and relax while having the delicious local seafood, which Tarkarli is famous for. Tarkarli is also a popular spot for scuba diving, due to the clear waters of the sea. With the help of scuba diving equipment, many local packages offer a vista to the under water world! Situated in the Parule village, 77 km from Sindhudurg, Nivati Beach is a tranquil inlet with stretches of beautiful white sand. The off-beat beach houses the old Nivati Fort, which acts a watch guard of the beach. 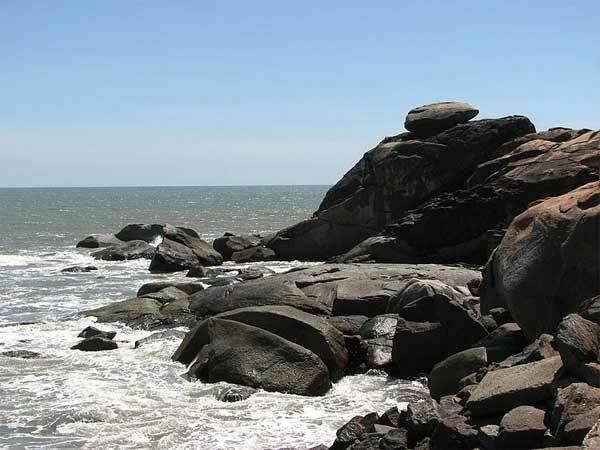 Three rocks called the Nivati Rocks are nestled about 18 km from the shore, which form a small island. Please the explorer in you by boating to this island. The calm beach of Korlai is located in Alibaug, a little farther than the rest at almost 400 km from Sindhudurg. Korlai used to be known as "Morro de Chaul", which in Portuguese means small and rounded hill. The breathtaking beach is known for its alternating stretches of black and white sand on the sea shore. Korlai Beach is also a very quiet, peaceful beach, perfect for a relaxed weekend. Korlai is also known for the Korlai Fort, which is an ancient fort built by the Portuguese, back in 1521. It has 11 gates, four on the outside and seven inside the fort. After an attack, the fort is now in ruins, but still a spectacular structure to visit. 3 km from Nivati and 80 km from Sindhudurg is yet another picturesque beach, that is the Bhogave Beach, some call it 'Bhogwe'. The fascinating thing about Bhogave Beach is that it is home to dolphins! If you're lucky you might get to see some of these dolphins, swimming in their natural habitat. Lay back and enjoy the peaceful sound of the waves hitting the shore. One thing to note about this beach is that it has rocks scattered in the water, so keep an eye out before diving or swimming into the water. Stretched for a length of 6 km and surrounded with Suru trees, Divegar Beach is a better-known beach than the above mentioned beaches. Closer to Korlai beach, Diveagar beach is located at about 340 km from Sindhudurg. The beach has a fishing settlement on one side and is home to migrating seagulls on the other. This beach, like Bhogave, is scattered with rocks. Diveagar Beach also houses a temple of Lord Ganesha, called the Suvarna Ganesha temple, built in 1998. The unique thing about this temple is the 24 karat gold covering the idol of Ganesha. Kunkeshar beach is located just 33 km from Sindhudurg. It offers not only a laid back time on the shores of white sands but also, a spiritual experience at the Kunkeshwar Temple, located near the shore. This temple is dedicated to Lord Shiva and is built in an exemplifier of South Indian style of architecture. The beautiful beach of Kuneshwar, surrounded with greenery and hills is also home to some dolphins. On the other side of the temple lies the Kunkeshwar Caves, in which lies the idols of Ganesha, Nandi and a Shivalinga.